Audi’s second generation A5 Sportback is lighter and more potent than its predecessor which never made it to our shores. However, we were pleasantly surprised to find out how well suited the car is to our roads despite its low-slung nature. Fret not that its only available with a diesel engine for it does offer very good real-world driveability. And as you can see here, it is quite the looker as well. If you are a motoring enthusiast in India without the deepest pockets, you would agree with me in saying that it’s a pretty humdrum place to be. Barring the not so affordable VW Polo GTI, Mini Cooper S and the recently launched Skoda Octavia RS (already sold out in India for 2017), every kind of performance car is going to set you back by a serious figure on your cheque book. So, every once in a while, when even a mildly interesting car comes along we ought to sit up and take notice. Which brings us to Audi’s soon to be launched A5 which you can see here. Agreed, that with a 2.0 litre turbo diesel engine this may not sound like a soul-stirring machine, but spot one on the road and its bound to get you turning around for a second glance. And the 2.0 TDI A5 Sportback deserves that attention if you ask me. 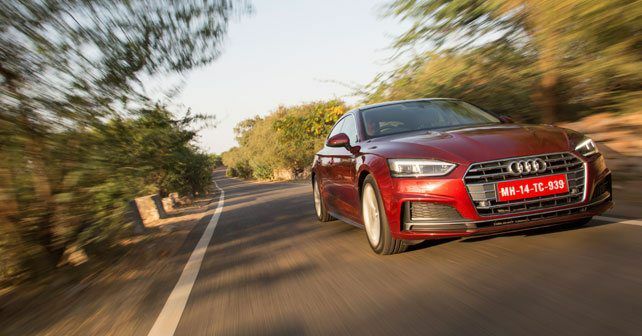 For with its bold signature grille, LED headlamps, flared wheel arches and well sculpted power dome, the A5 is a very nice-looking car indeed. The coupe roofline of the A5 Sportback is another reason behind its head turning looks for we have very few cars of the type on our roads. The whole car has a very squat down appearance as its pretty low set, it looks wide and has a stubby rear end. All of this makes sure that you simply can’t mistake the A5 for anything else. 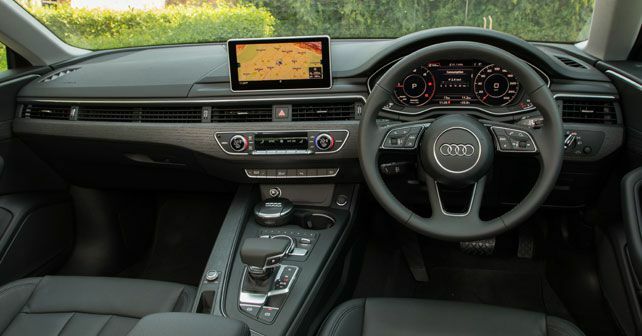 Step inside and the A5 Sportback’s cabin instantly reminds of Audi’s new cockpit design with its virtual instrument cluster, yacht style gear lever and air vents that flow across the dashboard. Because of the driver focused nature of the car and its coupe roofline, it is the most spacious at the front. The seats offer good support all around along with bolster adjust. And finding a good driving position is easy. The rear seat can accommodate two adults but isn’t the most comfortable place to be with its low hip point and limited head and leg room, especially for occupants taller than of average Indian height. Thankfully, the A5’s suspension makes up for this as it is really rather comfortable for such a low sprung, driver oriented machine, especially on Indian roads. 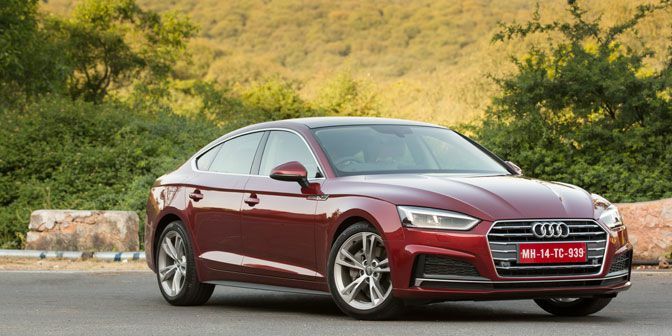 The A5 Sportback comes with five-link suspension at the front and rear, which offers a rather decent ride in all driving modes. Sure, there is an underlying firmness to the ride but even over sharp bumps in dynamic mode, the ride isn’t jarring as such, although there is some suspension noise as expected, but not to an alarming extent. So far as I see it, the only real problem with the A5 is its low ride height, which can be a bit intimidating on our roads. While most of our expressways are now supercar worthy, there will always be areas where the tarmac sinks in due to the heat and heavy trucks passing over and then there are those dreaded off-road like expressway exits that threaten low slung cars. So, you need to be really careful while clearing such areas. Otherwise, it’s all smooth sailing for the A5 Sportback as it dismisses road undulations and wavy tarmac with aplomb. Complimenting the Audi A5 Sportback’s user friendly nature is its 2.0 litre TDI oil burner which happens to be its only India engine option (for the A5 Cabriolet as well). Audi has worked well to tune this engine for in this 187bhp spec, the unit feels extremely smooth and NVH is well damped, to the extent that at initial revs and city speeds you can’t really tell if there is a petrol or diesel engine under the hood. And that’s high praise. As the revs rise though, the engine note of the diesel engine comes through, but it continues to have a very refined nature. Complimenting the commendable nature of the engine is that it always has decent poke. A healthy 400Nm of torque is spread between 1,750 – 3,000 rpm which gives the car very good driveability as it always has enough grunt at low speeds, meanwhile the 7-speed S-tronic automatic gearbox goes through the gears seamlessly under normal conditions. But when you are slowing down and speeding up at decent speeds, there is a little delay, but it’s nothing you can’t overcome by changing gears manually via the paddle shifters. 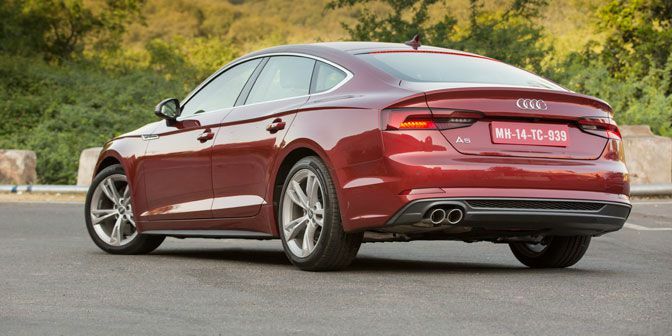 Out on the highway, the Audi A5 Sportback diesel offers decent cruise ability at triple digit speeds. There is always more than enough power available and you are always only a dab of the accelerator pedal away from a quick overtaking manoeuvre. The car’s electromechanical steering weighs up well as the speeds rise but feedback, as expected, is limited. That said, you can of course attack expressway bends with confidence and its only at higher speeds that some amount of body roll comes into play. 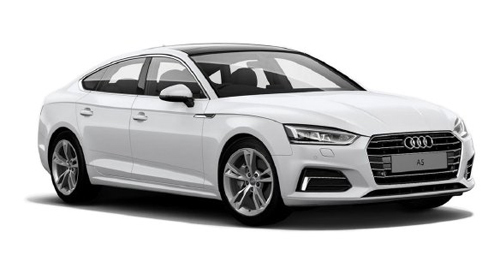 All things considered, the A5 diesel offers a very good practical package as a driver's car with its comfortable ride, willing and efficient powertrain, modern cockpit and a striking design that will surely appeal to anyone looking to buy a driver oriented car in the expected Rs. 55 – 60 lakh price bracket once it goes on sale soon enough.